Month 12: Start an online registry or book an appointment with a retail registry consultant at the location of your choice. It’s a good idea to start your registry early because friends and family might want to get you an engagement gift. Month 11: Define your couple decor style! This could take a while, so it’s wise to start early. Will you feather your nest with accents that are modern and sophisticated? Traditional? Eclectic? You’ll also want to start thinking about quantity. Will eight place settings really be enough to entertain the whole family at Thanksgiving, or will you need 12? Make sure you register for enough flatware, stemware, napkins and napkin rings to accommodate each place setting. There’s nothing worse than setting the table for 12 and realizing you only have eight wineglasses — trust us! Month 10: Start creating a Wish List. What are some of the items that you’ve always wanted (KitchenAid stand mixer, anyone?! ), and what items can you do without. Consider your storage space, too. You may want to consider registering for some larger group gift items or even your honeymoon and other experiences. Month 9: It’s time to build a complete registry! Share the experience with your partner and choose items that you want to include in your home together. Include registry information on your wedding web site and with your wedding save-the-date cards. 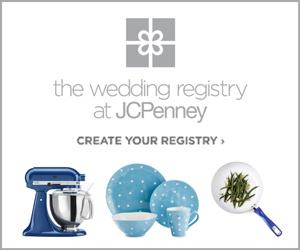 Month 5: Review your registry. You may need to add items of certain price points if you’re having a bridal shower. You can often add more items online, or you can speak to your registry consultant for guidance. Month 2: Send out your wedding invitations and include registry notification cards. Check your registry again to make sure that guests have plenty of options to choose from and that you haven’t forgotten any coveted items! Month 1: By now, you’ll have lots of emails notifying you of wedding gifts that guests have purchased from your registry. Be sure there is a good selection of items at various price points for last minute shoppers to choose from. Tip: Many stores have registry completion discounts that allow you to purchase those items that you didn’t receive without paying full price. The discount often extends to larger household items that you may not have included in your registry. Might be a good time to purchase that luxurious mattress you’ve been eying!